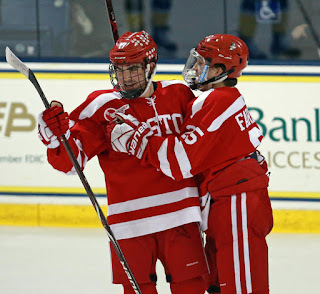 Dante Fabbro's third goal of the game, late in the third period, broke a 3-3 tie, giving BU a 4-3 win against Merrimack in North Andover. Fabbro’s two first-period goals—sandwiched around a Shane Bowers tally, had given the Terriers a 3-1 lead after the first 20 minutes before the Warriors rallied with two power play goals. The teams meet again tonight at Agganis Arena. The Warriors were first on the board, scoring on the rush at 4:39 when Brett Seney beat Jake Oettinger to the blocker side from the left dot. BU got its first power play opportunity at 16:32 and needed just half a minute to knot the score with Fabbro one-timing a Jordan Greenway pass from behind the goal line for a backdoor tally. Brady Tkachuk also assisted. Less than a minute later, BU took the lead when Bowers bagged his 10th goal on an odd-man rush with Drew Melanson, following a breakout pass from Cam Crotty. Melanson burst past two defenders in the neutral zone and slid a pass to Bowers, who closed and backhanded a shot past goalie Craig Pantano. The three-goal barrage was completed 23 seconds later when Ty Amonte carried the puck off the half-boards to the high slot and dropped it to Fabbro whose wrister zipped past Pantano, high to the stick side. Patrick Curry had the secondary assist. 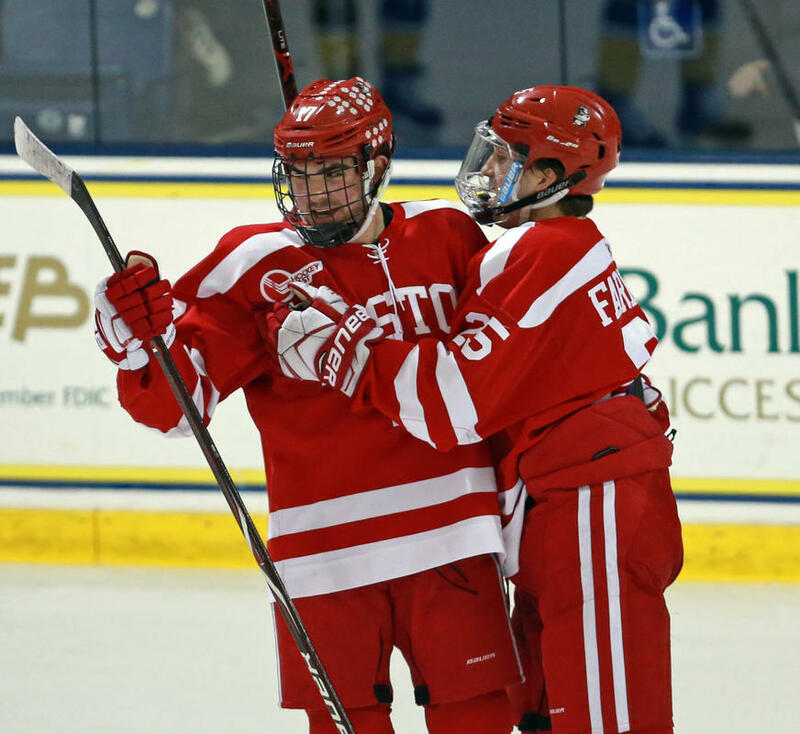 The three BU goals came in a 70-second span. Terriers had the territorial and shots advantage (14-8) in the second period, but the home team claimed the only goal on a power play as Marc Biega one-timed the rebound of a Cole McBride shot, that Oettinger saved, into a half-open net. The Warriors pulled even five minutes into the third period on another power play as Seney wired a shot from the left dot past a partially-screened Oettinger, again on the blocker side. The Nashville Predators’ 2016 first-round draft pick scored the game-winner twenty seconds after a hitting-after-the-whistle dust-up sent four players to the penalty box. 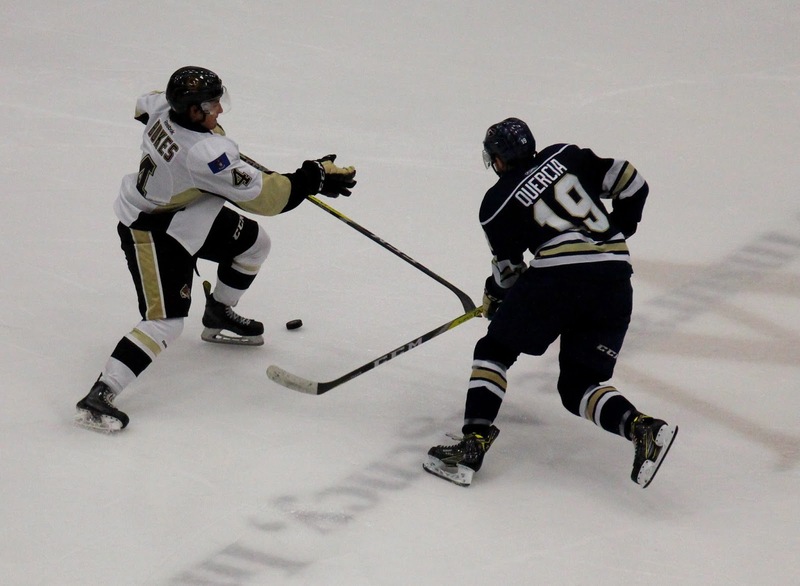 Bowers corralled a loose puck and sent it to Logan Cockerill in the left corner. 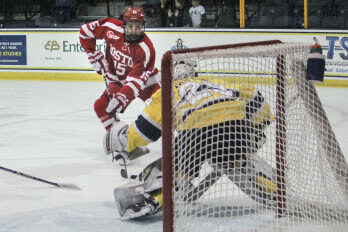 The freshman wing moved toward the net, drawing defenders to him, then backhanded a pass that found Fabbro charging “down central” and his one-timer flew past Pantano, low to the glove side. 2019 recruit Joel Farabee scored a goal and added two assists in the NTDP U18s’ 7-6 win against Cedar Rapids. Farabee now has 39 points (17G, 22A) in 33 games. Fellow recruit Jake Wise assisted on three goals including the game-winner. 2018 or 2019 Matt Quercia scored his fifth goal of the season in Sioux Falls’ 5-2 win against Central Illinois. 2019 recruit Robert Mastrosimone’s two-point night—a goal and an assist—helped the Chicago Steel to a 6-2 win against Muskegon.